NEW DELHI, -- India showcased an assortment of its indigenously developed weapon systems for the first time at its 68th Republic Day parade in New Delhi on 26 January. 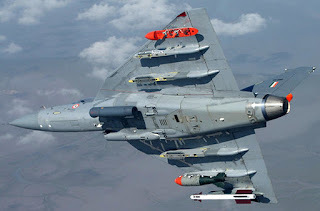 The displayed systems included the Mk 1 variant of the Hindustan Aeronautics Limited (HAL) Tejas Light Combat Aircraft (LCA), three of which participated in an 35-aircraft fly-past, which also featured the HAL Dhruv advanced light helicopter and the HAL Rudra light combat helicopter. Three of the 20 LCA Mk 1s ordered in 2005 have entered service with the Indian Air Force. An order for 83 upgraded LCA Ms 1As was approved by the Ministry of Defence (MoD) in November 2016. Hindustan Aeronautics Limited (HAL) Tejas Light Combat Aircraft (LCA) Mk 1 variant.